A home inspection can be a stressful time for home sellers. Most people are proud of their house, and don’t want someone pointing out imperfections in the home they love. In addition to being stressful for the seller, a home inspection can also be a hindrance to the sale itself. In most cases, even if there is a sales contract it is usually contingent on an inspection. Buyers may be experiencing “buyer’s remorse” that has started since signing the contract. They may be hypersensitive to negatives about the home, both real and perceived. As the seller, you want the buyer’s inspection experience to be low-stress and your home to be inviting and comfortable. Here are 10 tips for the home seller to prepare for home inspection. Make repairs to your home in advance of the inspection. Make any repairs to the home you are willing to make before the inspection. Fix leaks under the sink, replace smoke detector batteries, fix leaky faucets and perform other minor home repairs that you may have been putting off. When buyers and inspectors see several components that have lacked routine maintenance, it raises concerns about whether there may be major problems. For major repairs, or if you hire a contractor, keep the receipts and leave them on the kitchen counter. Disclose the items you’re not willing to repair. Consider preventive maintenance. “PM,” or routine servicing is a great way to impress the inspector. Professionally clean fireplace chimneys and heating and cooling equipment. Change HVAC air filters and clean roof rain gutters. Again, display receipts. Tidy up your house. Don’t put seeds of doubt in the buyers mind because of something as simple as cleanliness. A buyer feels much more confident purchasing from someone they perceive as neat and who has taken good care of the home they are about to possess. Clean your home at least as well as you would for any other showing. In fact, the inspector will show your buyers areas they probably did not see during the initial visits to the home, so remember closets, cabinets, and under sinks. Of course, don’t leave dishes in the sink, empty the dishwasher, clean toilets and pick up laundry. Remove pets. Some people are allergic to (or frightened by) pets, and you want to make the inspection as pleasant as possible. Even crated pets can be a distraction (barking and crying) and can be the source of unpleasant odors and allergens that can diminish the home in the eyes of the buyer. Leave during the inspection. Even though you may think you need to be there to answer questions, you really don’t have a roll in the inspection process, and despite what you may think, you really don’t want to be there. For one thing, in the course of a normal inspection, many sellers feel uncomfortable when the inspector does things like climbing on the roof, getting in the attic, running the heat and A/C full blast, running water at fixtures, and the like. But even more importantly, this is a time for the buyer and inspector. They may feel that you are somehow interfering with that time. Know that the inspector’s findings are confidential. Buyers are paying the inspector hundreds of dollars and want to be able to speak with the inspector candidly, without fear of insulting the seller. Make items accessible. Provide access to areas such as the attic, crawlspaces, access panels, electrical panels and HVAC equipment prior to the inspection. This may mean moving stored items and clothing. Be sure to leave keys for detached garages and locked doors. Turn on utilities. The inspector will need to operate plumbing fixtures, electrical components, and gas appliances. Be sure the gas is on, the propane or oil tank is full, all breakers are on, and all gas pilots are lit. If vacant, be sure the home is not winterized. Inspectors will not turn on shut off valves or light pilots for reasons of safety and liability and failure to have the home prepared can require additional trips to the home, resulting in additional fees and delaying the report. It’s also nice to set thermostats for the heat or air conditioning to comfortable temperatures so the buyer feels more at home when arriving for the inspection. Turn off home burglar alarms. You don’t want the buyers to meet your local police department. Even if the alarm is not monitored, be sure it is turned off. Going through an inspection with an alarm going off is very stressful, and we want this process to be as pleasurable as possible. Be patient. It may take a few days before you hear from the buyers regarding the inspection, depending on your contract. Don’t contact the inspector directly because their findings are confidential. The inspector does not decide what repairs the buyer will ask for and can’t speak on their behalf, so it’s best just to wait for everything to be presented in writing. 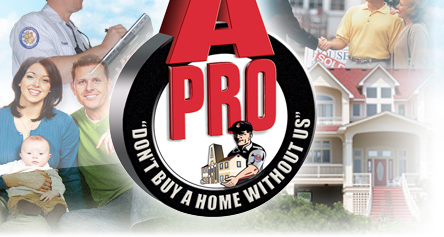 Senior Inspector Tuvell is the owner/operator of A-Pro Home Inspection Wilmington and A-Pro Home Inspection Kansas City has been personally performing professional home inspection services since 1995. This entry was posted on Sunday, July 28th, 2013 at 1:59 pm	and is filed under home inspection, home seller. You can follow any responses to this entry through the RSS 2.0 feed. Both comments and pings are currently closed.